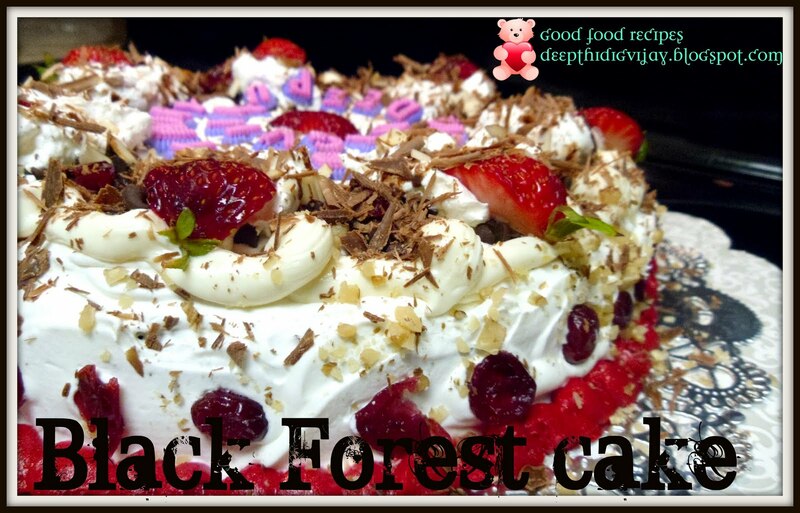 Black forest cake is my favorite. 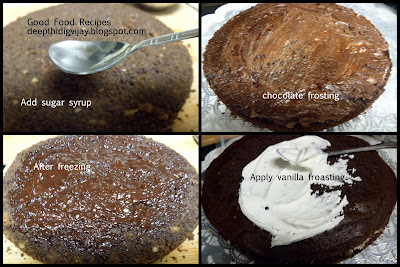 I think it is every one's favorite too, It just melts in mouth the chocolate twist in the cake gives yummy taste to this cake. 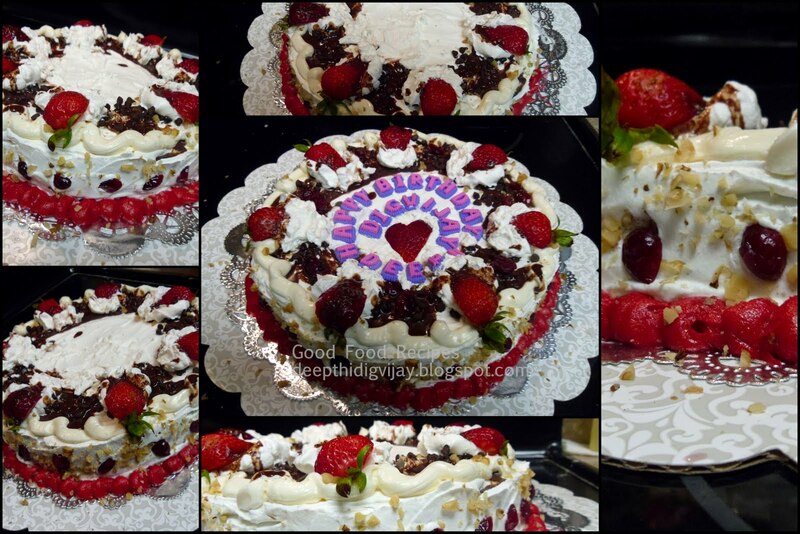 I made this cake and surprised my hubby on his birthday on last Friday Aug5th. He just couldn't believe that I made it, he kept asking me where did you order this beautiful cake. I just showed these pics and then he agreed with me. Friends it is so simple that you can make it in your home as well. I gave it a first try, believe me it came out really good. I love this recipe. 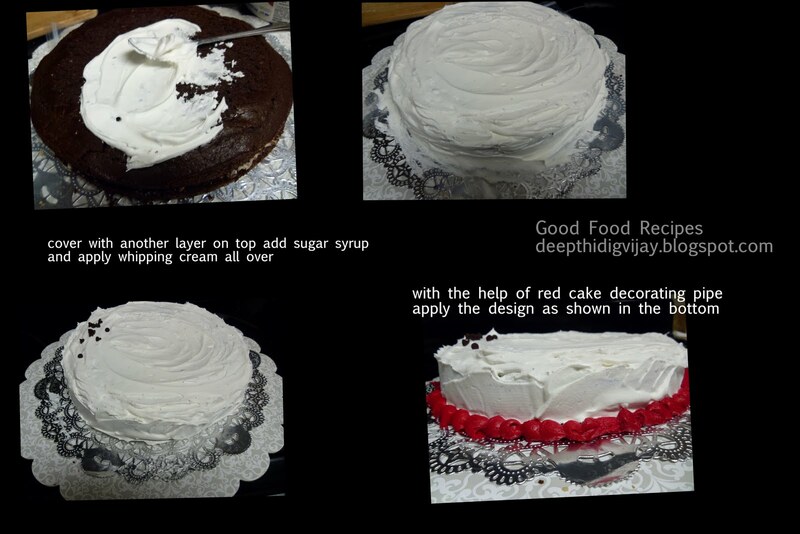 This will be very lengthy post because it includes cake decoration too so, please be patient to read the entire post. 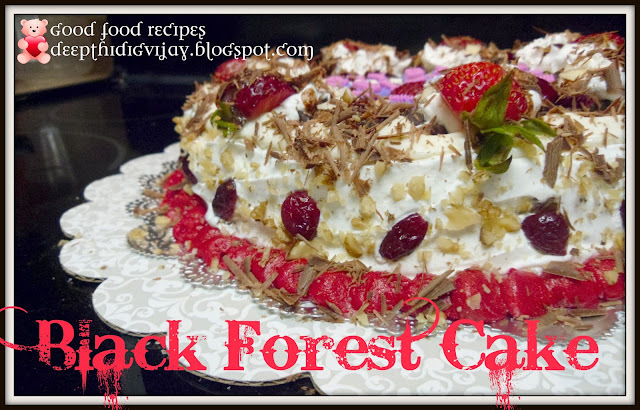 I have posted both eggless and egg based version, to satisfy both vegetarian and non-vegetarian's.Hope you like it. Makes 1 big cake of nearly 1.5-2KG, you can make 12 very large pieces. Take a big bowl that has enough area for mixing. 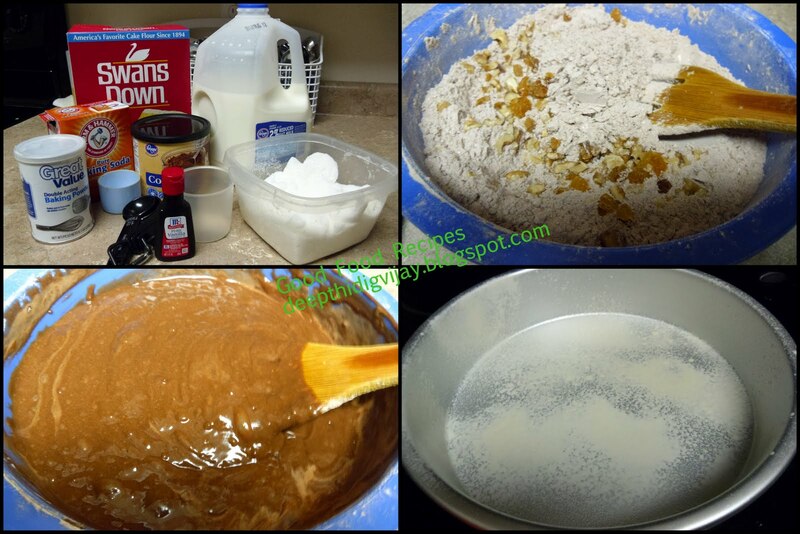 Take all purpose flour and add sugar, baking powder, baking soda, salt, cocoa powder and mix well. (Now brake in the eggs) Add milk, vegetable oil, melted butter, walnut, raisins and vanilla essance when it is hot at the center of the flour mixture. Mix well by just folding in the flour into the center from sides. Do not use any electronic device to mix the ingredients. When all the ingredients are well mixed then add 2tbsp of lemon juice and stir gently to mix the contents. Now prepare the baking tray by greasing with oil and line it with parchment liner(this is not necessary, but must if you want smooth bottom). Preheat the oven to 350F and bake it till the inserted tooth pick comes out clean. For me it took over 30min to get a nice cake. When you take out let it cool for about 15min an then you run the knife along the e dges to make sure cake does not stick to the tray.Now the cake is ready for decoration. Take a big bowl that has enough area for mixing. Take all purpose flour and add sugar, baking powder, baking soda, salt, cocoa powder and mix well. Brake open eggs and add along with milk, vegetable oil, melted butter, vanilla essence, raisins and walnut when it is hot at the center of the flour mixture. Mix well by just folding in the flour into the center from sides. Do not use any electronic device to mix the ingredients. Now prepare the baking tray by greasing with oil and line it with parchment liner(this is not necessary, but must if you want smooth bottom). Preheat the oven to 350F and bake it till the inserted tooth pick comes out clean. For me it took over 30min to get a nice cake. 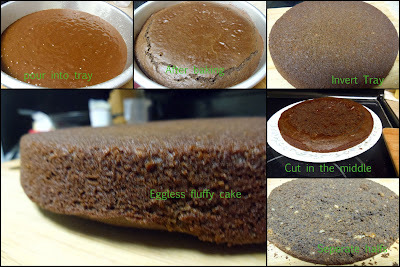 When you take out let it cool for about 15min an then you run the knife along the e dges to make sure cake does not stick to the tray.Now the cake is ready for decoration. Fro layering cut the cake from the center to make it into two halves. Now separate two layers. Prepare sugar syrup with 2tbsp of sugar in 30ml water and sprinkle this mixture on the top of the cake. This the the cake remains moist. Now cream with chocolate frosting and freeze this cake for 15min, then cover with vanilla frosting on top, add finely chopped walnuts(optional), raisins and cover with another half layer. Sprinkle come sugar syrup on top of it. Cover the entire cake with whipping cream.Start decoration from bottom, just drop red balls with the help of pipe cake decor on the bottom just like a chain as shown. Decorate with strawberry's/cherry's. Take the chocolate bar and chip it with the mandolin slicer. 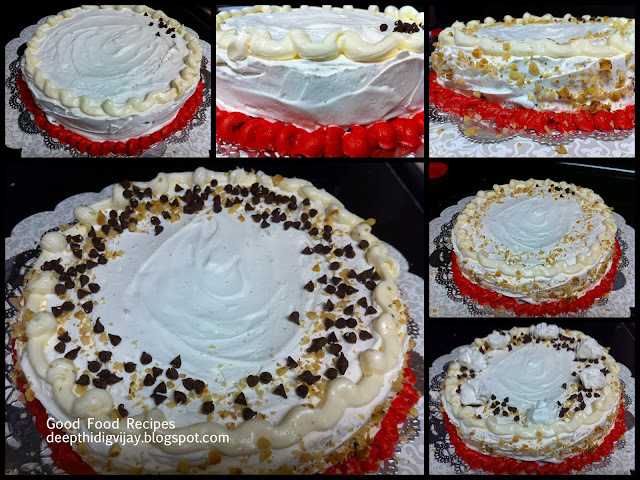 Cover the cake with all these chips even on sides, add walnuts/raisins or any thing you wish to you can play with it. Now the cake is ready. Arrange letters with the latter cake decorator. 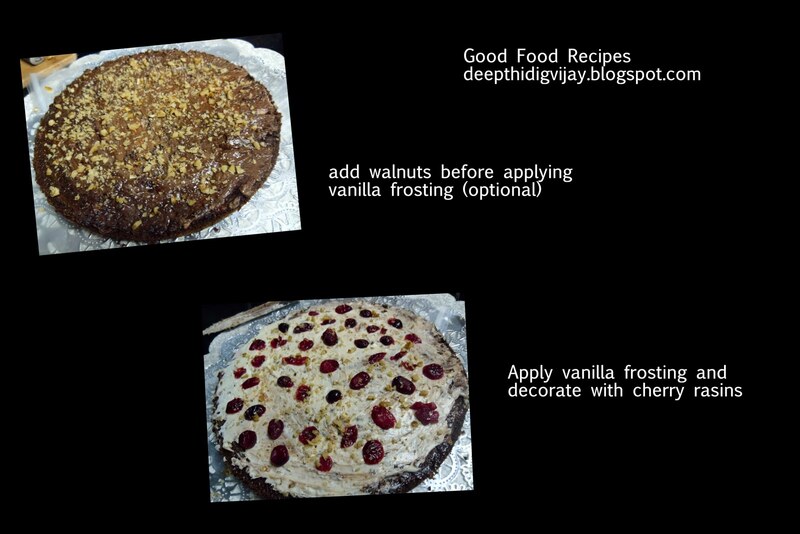 Refrigerate it (Do not keep in a freezer) for atleast 20min before to serve. 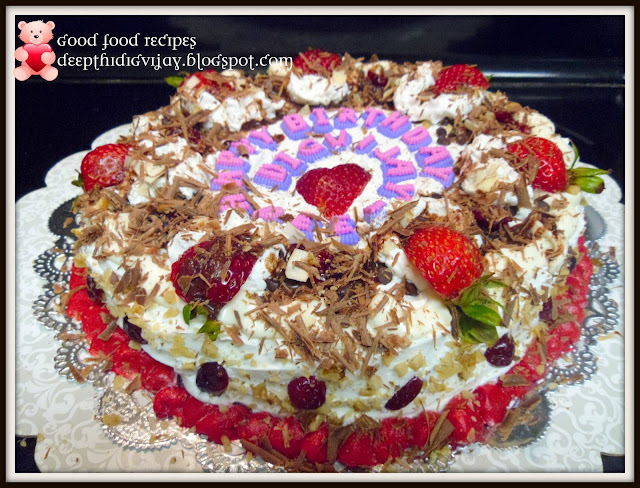 Hope you like my recipe, please feel free to post your comments. They are very valuable for me, you can even subscribe by e-mail to my blog, the recipes will reach your inbox. ThanX for visiting my space. Please bookmark it to visit/ remember again. Lovely and tempting cake.Thanks for that yummy piece. That really looks so yumm.. Lovely! Wat an elegant cake, looks stunning and marvellous..
My fav.. looks fabulous.. Nice step by step clicks..
wow! what a cake! thanks for the great instructions! You are amazing!! The cake loos great! Lucky hubby of yours! I love black forest cake too !! You inspired me to try making one at home! Thanks for sharing! That looks mouth watering dear, absolutely looks store bought. 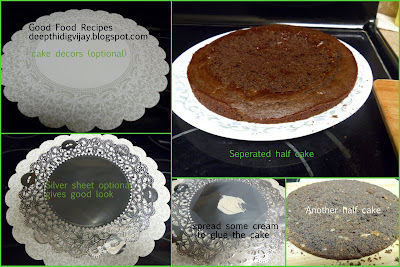 I still need to get my hands on layered cake, so will give this a try. Belated happy birthday to your hubby !!! Thank you all for the wonderful comments!!! Keep visitng my blog for more wonderful recipes to come!!! Hello there! I could have sworn I've visited this blog before but after going through some of the articles I realized it's new to me. And is whipping cream use for icing? do u mix with icing sugar?